The paperbacks and ebooks are now available for sale on amazon. Here is the link. The CD Recording of “VET LIT; How We Remember War,” Live At The Community Building, from our presentation on May 24th, 2015 is now available for $5.00 + $3.00 S/H. It is available for download from audiobooks.com for the amazing low price of $4.50, and is often on sale for $3.50. 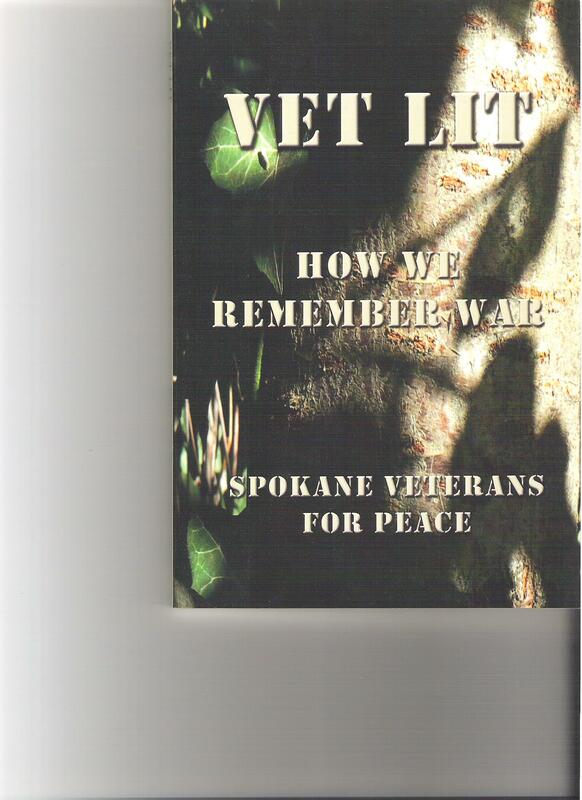 “VET LIT; How We Remember War,” is available for $10.00 + $3.00 S/H. Book & CD = $15.00 + $3.00 S/H. Our 2017 Release of “VET LIT 2; So It Goes” is now available for $15.00 + $3.00 S/H by writing to our mailing address at 35 W. Main St., M120, Spokane, WA 99201. Veterans For Peace are not your ordinary Government Issue soldiers. Our militarism, often accepted with gusto in the beginning, has turned sour and dark at its finish. Along with our fallen comrades, we have also fallen, due to the devastation visited upon humankind, by endless war in our name, the chaotic destruction of our fellow human beings. These writings, dedicated to our good peacemakers from WWI onward, contain memories of, and our response to, the experience of war; we offer essays, letters, stories, poems and prayers, to let you see, if you dare, into the minds of those who trained, fought, and lived the insistent social demand to physically confront other human beings. We now realize all that ferocious, vicious, reptilian behavior required of us (and infused into the young via competitive rather than cooperative “sports,”) was merely for purposes of a corporate colonialism, lining the already deep pockets of profiteers who lack the imagination of how to live peacefully with all peoples. As 22 veterans, plus many active duty personnel, end their suffering by suicide each day, here in the year 2015, we hereby testify to the tragedy of our nation’s historical policies of preparedness for destruction, as our projected violence and cruelty comes home to haunt us all. We write in contravention to yet another proposed ethereal war memorial, to be installed at the Spokane Veterans Arena, dedicated to the “fallen heroes of 911,” entitled “illuminating courage,” knowing full well these monuments serve only to perpetuate the reliance upon militarism which defers facing the real solution to our angers and fears – acceptance of empathy, love, compassion, understanding, and caring for all of our selves in this world of uncertainty and wonder. Please accept our offerings, this second printing of a little book, as an honest remembrance of our time in war, dedicated to a World Without Wars, with the energy, vision, and light to see the way forward to Peace, sweet Peace! Before we could be amazed, we had done it. This little group of peace mongers wrote, collected, edited, and published a book, Vet Lit: How We Remember War. It’s not that we’re some kind of literary society, or even a book club, but we decided we should do it. Most of us had written letters and essays as a matter of course, long after such items were academically required. All of us have opinions upon which we will gladly expound under the proper conditions, while a few are less concerned about conditions. Over the course of a few months, a professional writer joined our chapter and several in-house poets were revealed. It was decided that we could compile enough organic verses for a chapbook. Our poetry manuscript turned out to be interesting but rather slim, so we talked about other sources and began to uncover germane letters and stories and essays. Every veteran has stories that need to be heard, but not every veteran is called to write. The writers, enthusiastic and reluctant, have been tolerated very nicely by our other members, whose support has been vital to these projects. Although we crave greater diversity for Chapter #035, we thrive upon a wide variety of military backgrounds and experiences, levels of participation, and individual opinions and perspectives. We are inspired by the international Veterans For Peace organization that brings us together and convinces us that peace is possible and what we do and say matters. As we go to press, there is reflection upon the 100th anniversary of our country’s entry into World War I, the “War to end all wars.” Even historians sometimes miss the irony in that phrase as we continue camouflaging the nightmare reality of that senseless struggle with claims of glory and victory. If this country, this Earth, should somehow survive another century of misbegotten trust in overwhelming violence, how will pundits praise our perpetual war in the Middle East, our hot and cold love affairs with nuclear weapons, our worshipful spiral of military spending? To know what to expect, look at the ongoing celebration of the great and glorious U.S. war in Vietnam–millions of federally allocated tax dollars to help Americans pretend that we won that war, that American military personnel acted heroically without regard for their own personal safety, to kill millions of poor people and elevate war profiteers among the world’s ruling corporations. If you think we sound bitter, wait until the next generation of war survivors finds its voice. Our title is derived from Get Lit!, the annual literary festival of the Spokane area with origins at Eastern Washington University. Get Lit! organizers stirred something within us when they invited our chapter to participate in a public discussion of The Things They Carried by Tim O’Brien, our brother and VFP’s most distinguished fiction writer since Kurt Vonnegut. Besides being Vonnegut’s signature phrase for the inevitable mayhem of a war culture, “So It Goes” is the title of the Literary Journal of the Kurt Vonnegut Memorial Library, and we’re indebted to the Kurt Vonnegut, Jr. Trust for permission to use it. You may not need a Vet Lit sequel, but Spokane VFP does. This volume was not published to satisfy demand but to act upon supply. There were too many voices, stories, and passions still within our reach to let them fall like trees in a deserted forest. It’s our intention to make you happy and sad and angry and hopeful, and determined, as we all are, to end war as the default foreign policy of the United States.